Heat olive oil or butter in a small pan over medium heat. Add the garlic and cook, stirring often, until garlic is pale golden in color. Add green onions, salt, and pepper to taste and cook for about two minutes or until the green onions are wilted. Add half the wine, bring to a boil and reduce by half. Stir in 1 tablespoon lemon juice and continue to cook until almost all the liquid has evaporated. Remove from heat and cool completely. Add the softened stick of butter and the two teaspoons finely minced parsley and combine thoroughly. If not using at once, transfer to a container, cover, and refrigerate until needed; may be made several days in advance. Preheat oven to 475˚F. Use the compound butter to grease the bottom of a shallow baking dish. Place the shrimp in the baking dish in a single layer. Cut remaining butter into cubes and distribute evenly over the shrimp. Add the remaining wine (about 1/4 cup) and lemon juice to the pan. Season with salt and pepper and roast for 5 - 7 minutes, until the shrimp are just opaque in the center. Remove shrimp to a pan and keep warm; drain cooking juices into a small pan, bring to a boil, and cook until slightly thickened. 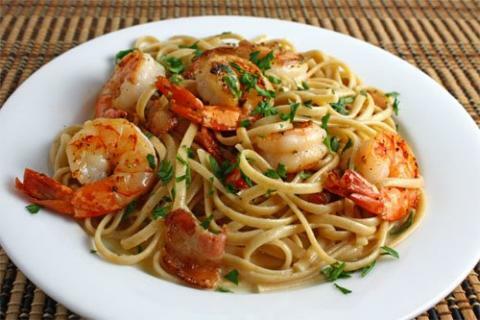 Toss pasta with sauce and remaining parsley, divide evenly among 6 bowls, and top with shrimp. Serve at once, passing Parmesan cheese and hot pepper flakes to garnish as desired.